Gut-wrenching recollections of the horrendous, years-long abuse inflicted on the author by his alcoholic, emotionally disturbed mother, and of his participation in the similar torture that his brother David described in A Child Called “It” (1999). Pelzer has a guilty conscience, it seems, and so—for therapeutic reasons—one of his aims here is to explain why he was a coconspirator in the mental and physical tormenting of his older brother some 30 years ago. As a young child, he states, he lived in constant fear that he would replace his brother as the one of the five sons their mother singled out for particularly brutal treatment. In the interest of self-preservation, then, he became Mom’s accomplice, purposely creating situations that would arouse her wrath and lead to harsh punishment of David. After a time, he reports, he came to relish “the bitter sweetness of causing him harm.” Finally, in 1972, the authorities removed David from the family, and eight-year-old Richard, as he had feared, became the new object of his mother’s cruelty. Meanwhile, another brother took his place as her “Little Nazi.” What Pelzer was subjected to beggars the imagination: Mom’s tactics included bloody violence, degradation, and humiliation. Sometimes, though, the author’s memory seems suspect: Could anyone physically swallow four mouthfuls of Tabasco sauce, as he asserts he was once forced to do? It’s also hard to understand why no one intervened, since Pelzer makes it clear that relatives were aware of his mother’s drunkenness and mental instability, neighbors witnessed the beatings, a nurse at a local hospital recognized as child abuse the battery his body had received, and school authorities had previously seen the need to rescue his brother David. 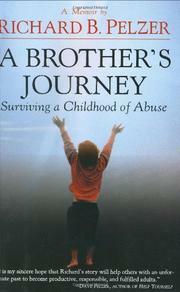 The author’s explanation is that community awareness of child abuse is much higher today than it was in the 1970s. If so, disturbing accounts by survivors like this one must take some credit for the change. Corroborates David’s memories, but provides no special insight into abuse.